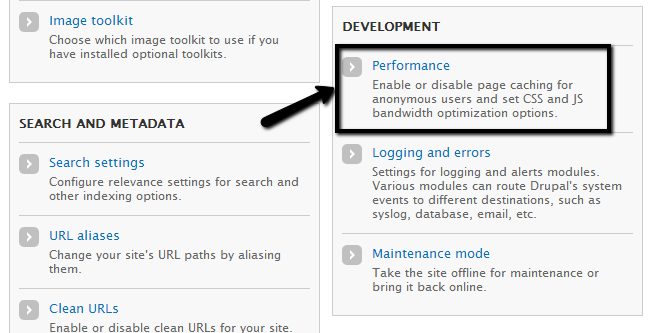 This tutorial will review the process of enabling caching on your Drupal website. If speed is what you are looking for, this is a good way of achieving your goal. To enable caching, you need to log into your website as administrator and click on the Configuration tab from the main menu. 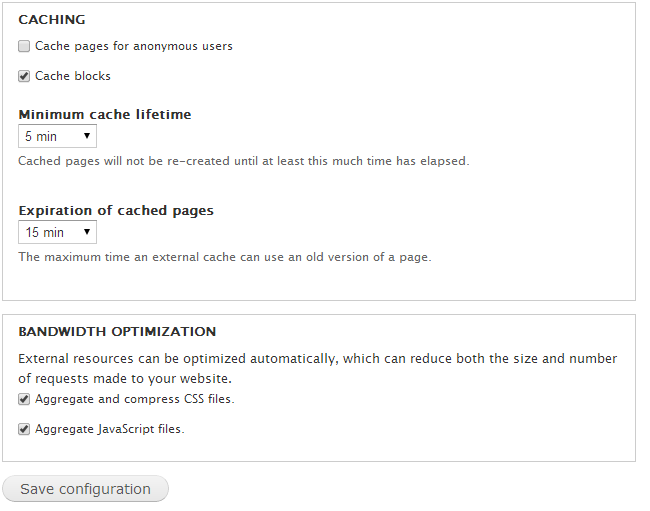 Caching - Set the caching for blocks and specify if caching should be also used for anonymous users on your website. Minimum cache lifetime - Set the minimum time before a cached page can be recreated. Expiration of cached pages - Set the maximum time an external cache can use a cached page. Bandwidth optimization - Enable aggregation of CSS and JS files. To clear the cache, you will have to access the cache manager again and then click on the Clear all caches button.